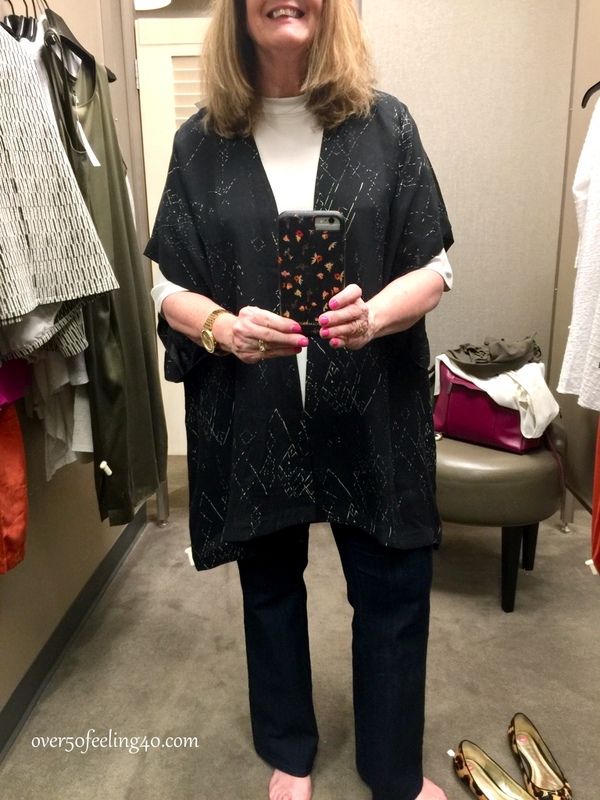 I enjoyed my time at Nordstrom so much recently experiencing the early treasures for the Nordstrom Anniversary Sale and thinking Fall 2018. It is almost as much fun as holiday shopping, because the store is full of shoppers and excitement. Their employees are extremely helpful, and the one who helped me this time was a true stylist. She introduced me to a few selections I would not have chosen on my own. 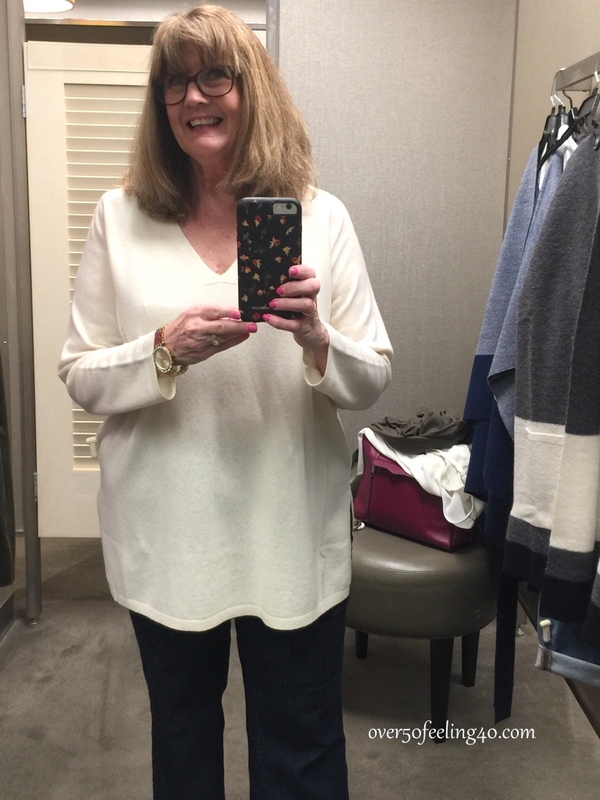 I also found some Eileen Fisher pieces that I loved…of course not on the sale. Like this olive green Stretch Silk Tank Dress (suprisingly flattering) which is under an amazing Print Silk Blend Kimono, also styled to be more fitted than the usual kimono…these are below. 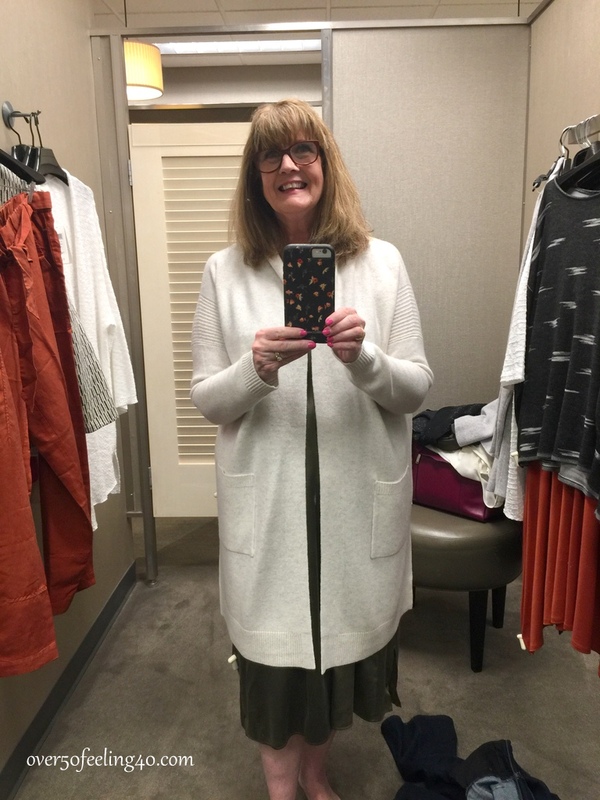 In the first picture, I am wearing the Eileen Fisher cashmere tunic from the sale, and below I am wearing a cardigan by VINCE also from the sale. But, I ended up ordering a KRISTEN BLAKE PLAID TOPPER COAT and the Eileen Fisher Slim Ankle Pant in Plaid which are similar to the style of the pants I often wear on the blog. And plaid was on my wish list….looking at the fall items in this sale, there will be lots of plaid around. I will take photos with these when they arrive, and let you know if they are keepers. 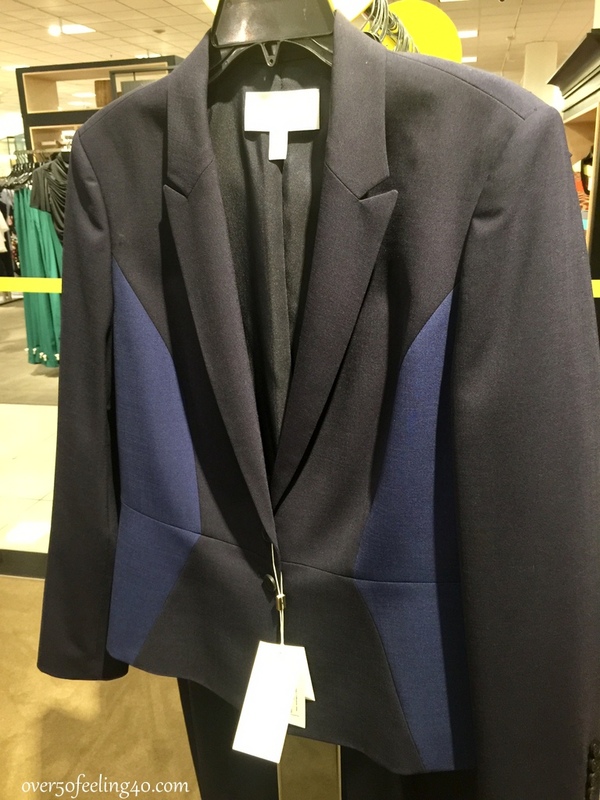 If I was in need of a power suit for work, this Hugo Boss jacket would have been in my shopping cart. The style of this jacket is so flattering for any figure with the way the color is laid into the sides. It is gorgeous. 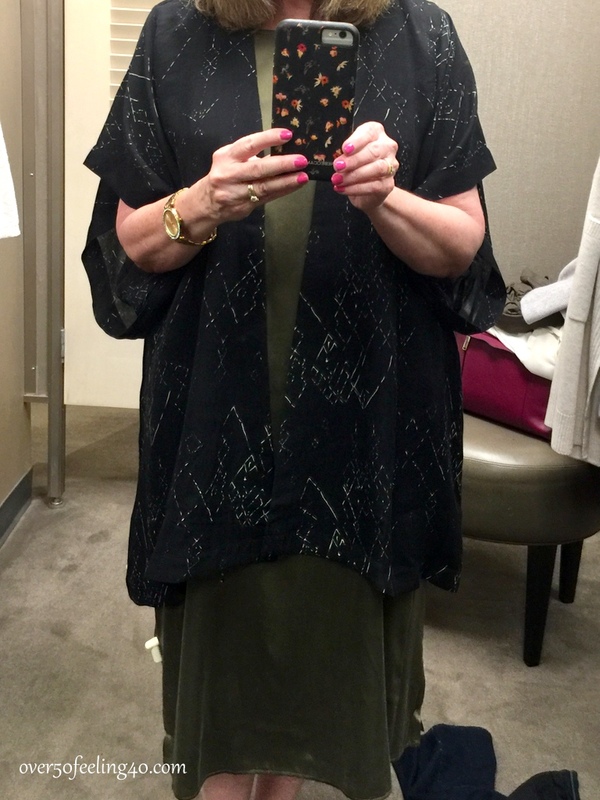 I do love this kimono and I am still thinking about it………….but it wasn’t on my fall list!! Oh Well………I have placed many items in the slideshow below. The sale items are only available to Nordstrom Card holders until July 19, but if you want to apply for a card you can do so HERE.  It’s sale shopping time, so………………………………………………………………………………………………………..
Pam, I absolutely love everything that you tried on and your suggestions! You look fabulous in everything you tried on. I live in sunny Southern California now and miss fall so much , but I could probably wear some of these things for our winter here! 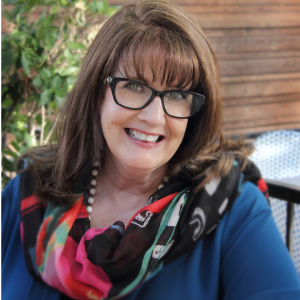 Thanks Susan….it is fun to go shopping with all of you who take time to stop by and read! I always pick the lighter items. We do have some cool weather, but it is minimal compared to northern states. Usually what I purchase is for the milder winters. Thanks for being here. I like all of these items, but especially the kimono with the pants. I’d definitely wear that! 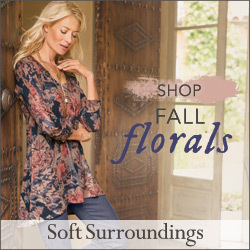 I love this kimono….I still have it on my wish list. Thanks Cindy! Everything looks great on you! Alas, I am short (not petite), so many of the pieces would be way too long for me. They have versions for petites, Becky. Spend some time on the webstie and you will see.